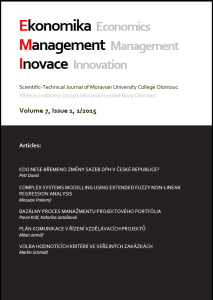 EMI (Economics Management Innovation) is an open-access double blind peer-review scientific journal which focuses on publishing the results of research and theoretical studies, papers and reviews from the field of economics & management and related disciplines. This means that all content is freely available without charge to the user or his/her institution. Users are allowed to read, download, copy, distribute, print, search, or link to the full texts of the articles, or use them for any other lawful purpose, without asking prior permission from the publisher or the author. The journal was established in 2009 and is issued three times a year. We accept papers in English, Czech and Slovak language. EMI is issued as printed and also digital journal. Full texts are available from our website.